Downtown Midland’s lane reduction test: Can less be more? What if removing one lane from a multi-lane road could reduce crash rates, improve pedestrian safety, create a more bike-friendly atmosphere and promote better land use? Officials are hoping a current lane reduction test along nine blocks of Buttles Street, which is a three-lane, one-way business route in Downtown Midland, will lead to just that. Lane reductions, also called “road diets", can take many forms, but it is essentially the method of removing at least one lane and turning that pavement over for other purposes. Road diets are generally applied to streets that have excess capacity, where implementation won't create congestion. Plaudits believe the efforts are well worth it, and it seems they have the data to prove it. A mock design of the improvements to be made in Carmel, Indiana. 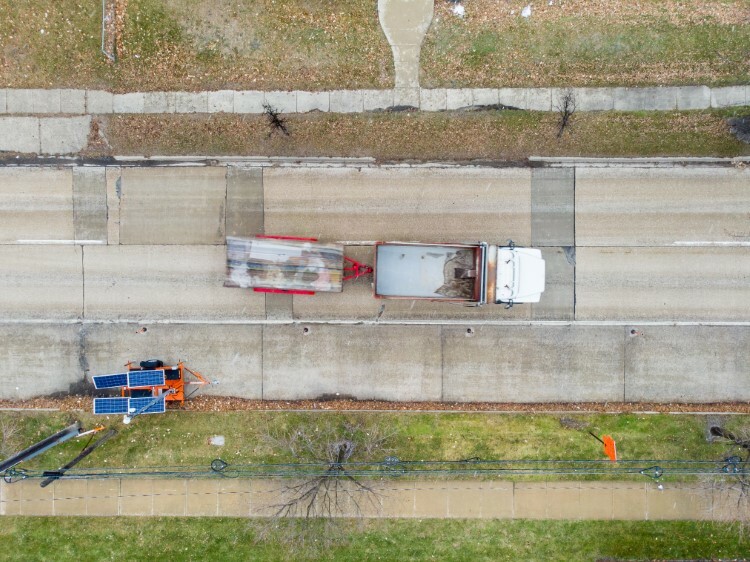 Several years of before-and-after studies of road diets have caused the Federal Highway Administration (FHA) and local transportation departments to give the green light to projects in hundreds of communities throughout the United States. FHA studies have found that simply reducing the number of lanes dedicated to cars cut vehicle accidents by anywhere from 19 to 52 percent, thanks to reduced speeds and fewer opportunities for collisions. Road diets have served nearby communities well. The Genesee County Metropolitan Planning Commission reduced lanes on over 19 miles of roads, successfully reducing crashes by an average of 30 percent. The Metro Detroit communities of Birmingham, Romeo, and Royal Oak have each implemented road diets and successfully lowered crash rates. 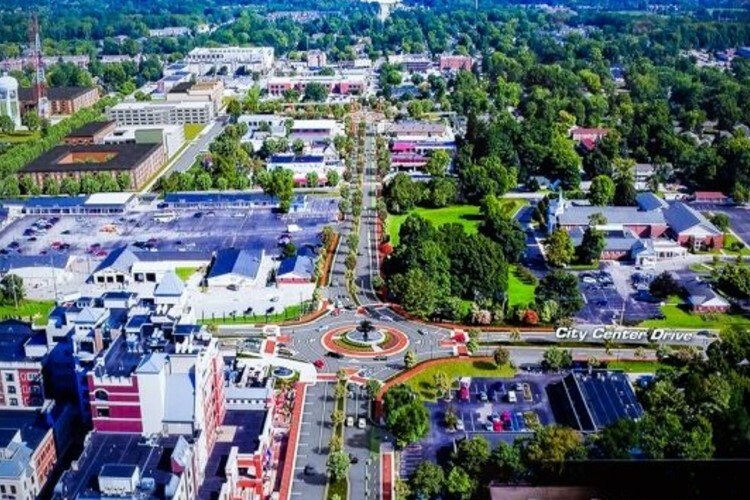 The City of Carmel, Indiana announced last year a $13.5 million project to eliminate traffic lanes, replace lights with roundabouts, and turn a large section of pavement into a landscaped corridor. In nearly every instance, there tends to be local opposition – at least until the diet takes effect. “First and foremost, I think we’re a town worth slowing down for,” says Acosta. Midland is no different, with several comments in community Facebook groups and letters to the editor of the local newspaper from residents who don’t see the value in losing a lane. "Half the battle is getting people to buy in," says Neil Gaffney, a public affairs specialist at the FHA. Some Midland residents have also written in support of the project, including Tyler Kring, who lives and works in the downtown district. He expressed frustration at the large highway dividing the urban area. “I would like to be able to walk or bike to work in the morning, but the headache of trying to play Frogger and cross Indian and Buttles first thing in the morning is something I avoid,” wrote Kring in a recent letter to the editor of Midland Daily News. Midland officials hope to get public buy-in by focusing on potential improvements and pointing to testing results, which so far have proven that traffic is flowing without issue. Evidence suggests caution when implementing road diets on corridors carrying more than 20,000 vehicles per day. Buttles and Indian streets, which officials hope can both eventually be changed from three-lane one-way streets to two lanes along a corridor spanning nine blocks, have an average daily traffic of about 12,000. FHA studies have found that simply reducing the number of lanes dedicated to cars cut vehicle accidents by anywhere from 19 to 52 percent. Because the road is part of the US-10 Business Route, the Michigan Department of Transportation (MDOT) has ultimate authority over the lanes. For their part, MDOT has expressed a desire to work with communities and are willing to help facilitate road improvements where possible. A recent study of Buttles Street during the road diet test indicates minimal delays, if any. "Currently, Buttles is operating at a level of service 'A' both from a speed perspective and a delay perspective," says David Hoeh, operations engineer for MDOT. MDOT rates the level of service for roads on an A–F scale. A is considered excellent, meaning traffic is flowing as it should and vehicles are moving through lights in a single cycle. The road diet test will continue beyond the completion of the M-20 bridge project to ensure officials are getting a complete picture of average traffic patterns. Grant Murschel is the planning director for the City of Midland. He believes that Midland, along with many communities across the nation, has learned there are repercussions to dissecting urban areas with multi-lane highways. Grant Murschel planning director for the City of Midland. 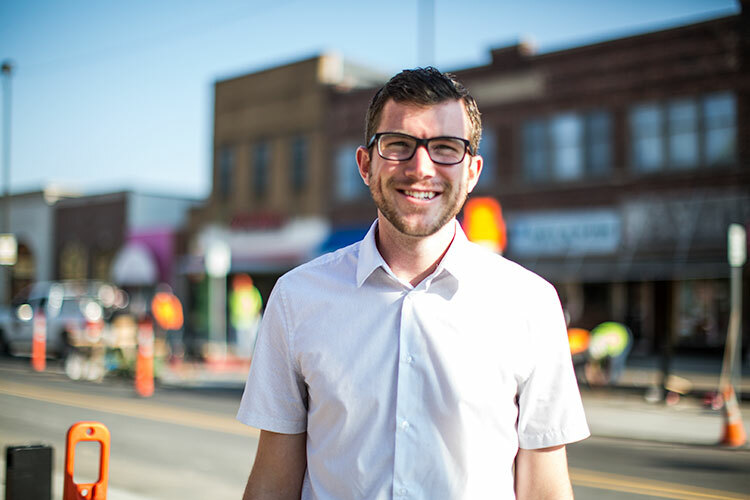 "Creating six lanes of fast moving traffic through our downtown may have caused more harm than good – especially in the long term," says Murschel. "Increased speeds and traffic noise caused adjacent home values and overall desirability to substantially decrease over the years. Traffic at the time of construction was higher due to higher employee numbers and access into the nearby manufacturing facilities, but today we just don’t have the need for that kind of capacity; gate access has also changed." Murschel and others believe that right-sizing Indian and Buttles through nine blocks of Downtown Midland will pay dividends for area residents while avoiding a negative impact on traffic flow. While the home values between the two one-way streets never recovered, several businesses have gone up along the corridor that could also benefit from a road diet. 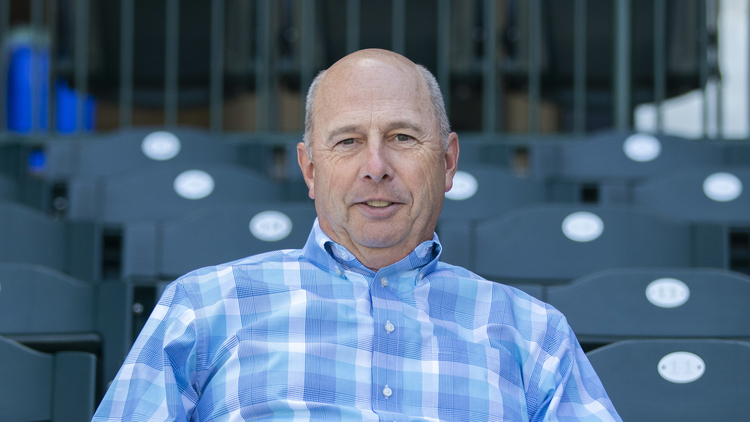 David Ramaker, President of the Michigan Baseball Foundation. One thing the City of Midland wants to make clear is that the current barricades are temporary and the “road diet” is not permanent at this stage. Potential developers also have an interest in the project. Jenifer Acosta, a real estate developer responsible for several projects in the region, describes the traffic calming project as a potential boon for investors. From an investment perspective, Acosta chooses projects on a variety of factors, including how pedestrian-friendly the district is. In addition to the potential road diet, Acosta believes there are other opportunities for Downtown Midland.